Qamhyieh means “wheaty” and is simply boiled wheat mixed with dried fruits and nuts, sweetened with sugar and scented with orange blossom water. You could say it’s our local take on granola! Qamhyieh is our Barbara sweet, the local Halloween, on December 4, that commemorates Santa Barbara, a fervent Christian who lived in Baalbeck, says the myth, and was running away from her father, a pagan general of the Roman army, when a bare field miraculously grew with tall wheat where she could hide. Qamhyieh is also traditionally made when a baby’s first tooth appears, to be shared with family, neighbors, and guests. Bring a pot of water to a boil and add the wheat berries. The water should cover the wheat berries by 2 fingers. Lower the heat, cover, and cook the wheat berries until soft. This may take up to 2 hours. When cooked, the cooking water should be thick and have a gravy-like consistency. If this is not the case, raise the heat and boil uncovered. 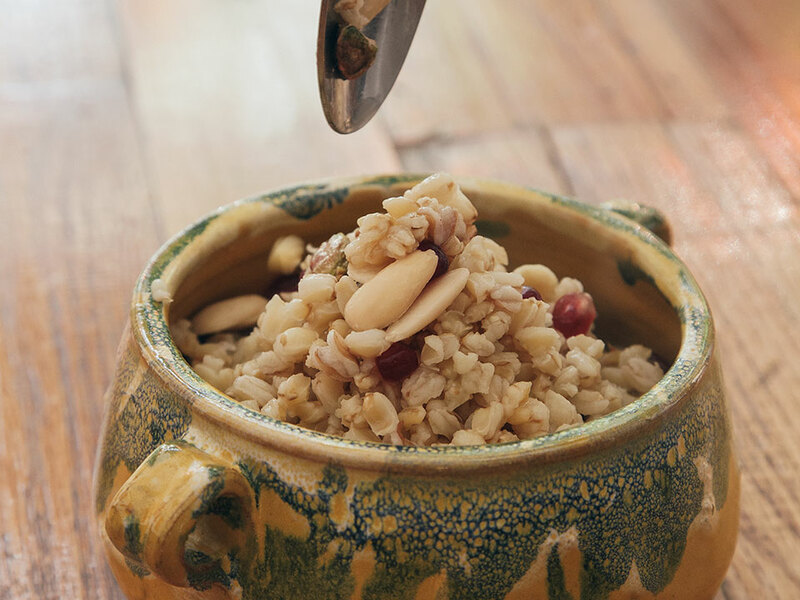 Meanwhile, soak the almonds, pistachios, pine nuts, and walnuts separately in bowls of water to cover for 2 hours. Drain, and peel the almonds, pistachios, and walnuts (rubbing them in a clean kitchen towel will help). Add the sugar to the warm cooked wheat, and stir well, then add the orange blossom water, all of the nuts, and the raisins. Finish by topping with the pomegranate arils. Serve immediately.